Small town Sheriff Martin Blake and movie starlet Fiona Rae try to defend the world from an onslaught of giant killer shrews that a mad scientist has created when trying to find the cure for rabies. 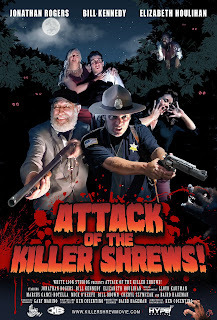 This remake/parody of the 1959 cult classic THE KILLER SHREWS was made on an estimated budget that is far less then its 1950's counterpart. Unlike that film though this shrew movie hasn't got much charm going for it outside of some hilarious dialogue at times and some eye candy. Maybe its the fact that the movie is well aware of what it is trying to do, and just doesn't capture that same charm of the 1959 movie. Though its heart is in the right place, maybe playing the movie a little serious compared to its obvious 'lets be funny' routine which runs thin quickly. Still, worth watching at least once if you want to see some absurd acting, cheap...very cheap....props, and of course Lloyd Kaufman of Troma fame making an appearance.